Transformers is far and away Michael Bay’s best comedy. It’s a little jarring when Transformers starts and the first frames announce it as a Dreamworks and Paramount Pictures presentation in association with Hasbro. That says so much about what’s to follow, even knowing full well this mega-budget extravaganza is based on the popular toy line from the 1980s. Back in those days, the toys spawned hand-drawn, animated cartoons. Now they’re back on toy shelves from shore to shore, this time supported by a CGI-laden live-action cartoon. Not surprisingly, the story is slight. Back on the planet Cybertron, Autobots (led by the most righteous Optimus Prime) battled Decepticons (led by the evilicious Megatron, portrayed here in a surprisingly small role). The source of their conflict was control over a powerful cube that wound up getting blasted into outer space. Much like the Transformers themselves, this movie rapidly shifts from high-comedy to over-the-top action. Perhaps not-so-surprisingly, given Michael Bay’s choppy résumé (which includes the decent The Rock and the Godawful The Island), the comedy actually works much better. The action scenes are so manic and fueled by such testosterone-driven pixilation, they wind up being the most uninvolving segments of the movie. While the action is heavily steeped in technology, the humor is where the movie finds its humanity. And that humanity is what drives the underlying story, which is ultimately about a boy and his car. The boy’s name is Sam Witwicky (Shia LaBeouf, Disturbia) and the car is a burnt-out Camaro his dad buys for him from a huckster used car dealer (gamely played up by Bernie Mac, Ocean’s Eleven). It becomes clear form the outset that Sam’s yellow Camaro has a mind of its own, one that can set the right tone by selecting the right pop song off the radio. Those scenes between the boy and his car are funny, as are those in which the gigantic Autobots play a sort of hide and seek with Sam’s parents outside their swanky house. Transformers does get credit for feeling at least reasonably fresh. It is, after all, the “biggest” non-sequel movie of the summer. But that fragile, nifty idea is shattered by the filmmakers” penchant for gangbuster action. Perhaps all three of these gentlemen should take a vow that their next movie will not involve a top-secret, clandestine-to-the-point-of-non-existent organization like this film’s Sector 7 and any number of such organizations the writers concocted in the TV series Alias. In a clear case of pandering, it is said the National Security Agency hires kids “right out of high school” because they are such technically-adept hackers and so globally aware they know all about top secret technologies in Iran and China. Those kids (including the highly amusing comic actor Anthony Anderson, The Bernie Mac Show) are the government’s key to decoding the electronic babble transmitted by the evil Decepticons. Sadly, the filmmakers don’t think their audience, ostensibly the same crowd as the brilliant teenage hackers portrayed in the movie, will know where the heck in the world Qatar is. Hence, each time the movie shifts to that location, the subtitles boldly state QATAR — THE MIDDLE EAST. And therein is the movie’s biggest loss. With American soldiers entrenched in Qatar (that’s in the Middle East, by the way), the movie had a tremendous opportunity to be topical and make a statement on current events. Unfortunately, in this high-tech age when American lemmings are hearing they must own an iPhone in order to maintain any degree of self-respect and social relevance, it’s a shame this movie squanders its opportunity to itself be more relevant by relegating a couple political jabs, courtesy of Sam’s relatively loose parents, to the beginning of the end credits. 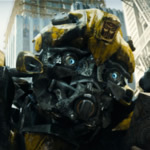 As it stands, Transformers is a mostly entertaining romp. But if Bay and company had only put a wee bit more thought into the story and their overarching objectives for bringing Transformers to the big screen, they could have transformed this movie into a real classic.